Training for a triathlon can take up a lot of your free time. The good news? As a triathlete, you have a lot of options and the pool is one place where you can get a beneficial workout when you're short on time. The two sample pool workouts below are short; that doesn't mean they aren't as valuable as your long, slow swims. Swimming at a sprint speed over a short distance helps to develop the neuromuscular programming that's necessary to increase your average swim speed. 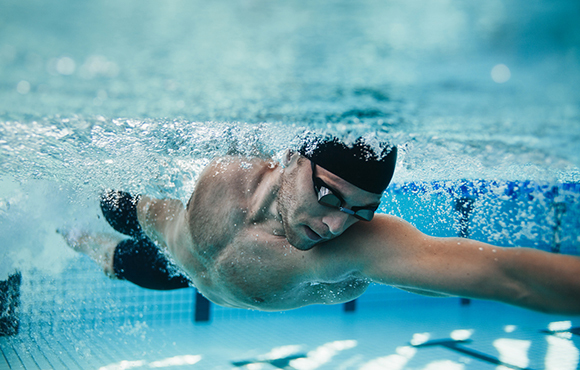 To make the most of your time in the water, try these quick workouts that will mix up your training and get you ready for race day. If you're a sprint-distance triathlete, T-Pace is the fastest average pace per 100 meters that you can hold while doing 3 x 100 meters with a 20-second recovery interval (RI) between each rep. If you're an Olympic distance or Ironman racer, your T-Pace is the fastest average pace per 100 meters that you can hold while completing 3 x 300 meters with a 30-second RI between intervals. Your 50 T-Pace is the 100 pace divided by two. If you don't know T-Pace, complete a warm-up followed by the T-Pace test set for your race distance prior to doing the workouts below. 1. Complete an easy 200-meter swim. 2. Follow with 3 x 100 meters—Swim the first 50 meters and build speed through the last 50 meters (take roughly 15-second RI between each one). 1. 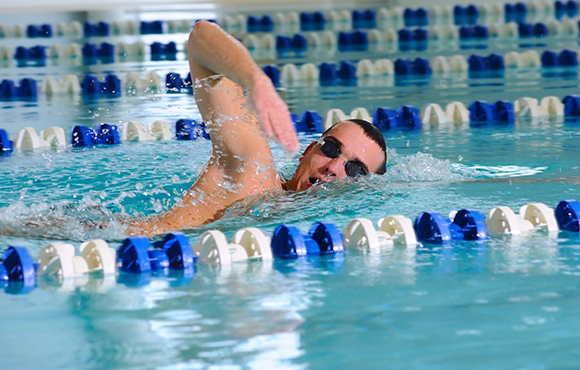 Swim 200 meters at a moderate pace, followed by an aerobic swim (30 seconds recovery). 2. Complete 5 x 50 meters at T-Pace with a 15-second RI. After the last set, go into next interval without rest. 3. 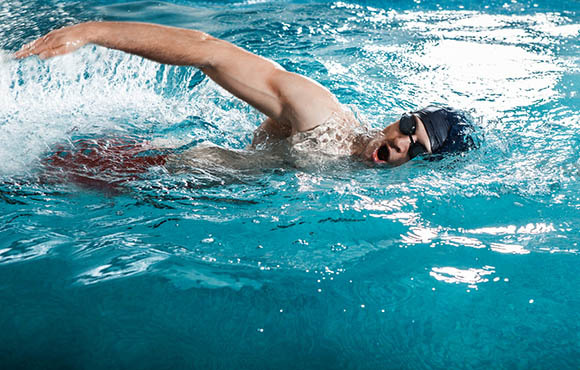 Swim 200 meters at a moderate pace, followed by an aerobic swim the same as before with a 30-second recovery. 4. Swim 3 x 50 meters at a pace faster than your T-Pace followed by a 20-second RI. After the last interval, move into the next set without resting. 5. Swim 200 meters at a moderate pace, followed by an aerobic swim with a 30-second recovery, going right to the next swim). 6. Swim 2 x 50 meters at maximum speed (15-second RI). 1. Swim 100 meters very easy. 2. Total distance should reach 1,700 meters. If 1,700 meters is too much for you to do in 30 minutes, cut the 200 meters to 100 meters. If you need the distance reduced further, take one interval out of each set of 50 meters. 1. Complete an easy 200 meters. 2. Swim 4 x 50 meters. For the first 25 meters, don't use your arms and practice only your kicking (no fins or kick board). 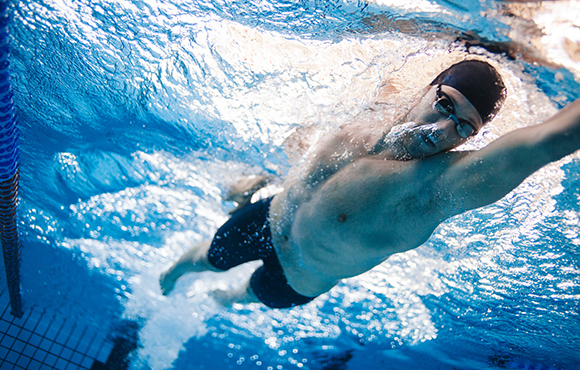 For the second 25, swim to cover the most distance possible with each stroke. 1. Swim 2 x 25 meters. Build speed throughout each 25-meter interval (10-second RI). 2. Complete another 2 x 25 meters. 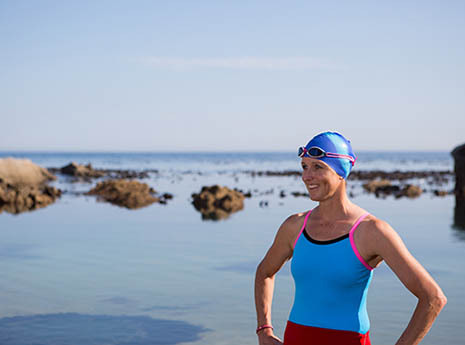 Swim the first half of the distance as fast as you can and swim the other half easy (10-second RI). 3. Swim 1 x 25 meters as fast as you can (10-second RI). 4. Follow with 1 x 50 meters relaxed and easy (10-second RI). Recover for one minute after the last 50, followed by the set below 2 to 4 times. 1. Swim 50 meters at T-Pace (15-second RI). 2. Swim 100 meters slower than T-Pace. 3. Swim 50 meters at a pace much faster than T-Pace. Make sure you can hold the pace for all three 50s (15-second RI). 4. Total distance covered is 1,650 meters. If 1,650 meters is too much, reduce the number of times you repeat the second subset of the main set.